A childhood friend of mine, with whom I still get together regularly, only just figured out one of my tricks last week when he had me over for Vegan Lesbian Thanksgiving. "You're just putting together random words [that don't make sense], aren't you?" he asked, after something I said hurt his brain. Well, close. It's actually a bit of an art--hacking the brain--to put together a combination of words whose meaning is truly ambiguous, and not simply silly or wrong. It's easy to take a common expression and toss a "not" in front of it, and people will understand what you're saying, find it doesn't flow well, think you unoriginal, then go right on disagreeing with you. If you instead create a puzzle whose pieces cannot fit, those who try to piece it together stumble because they can't. As a case study, take the expression "Thank Goodness It's Friday". 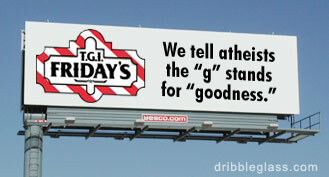 I never bought the claim that the "G" in "TGIF" meant anything but "God". As a stubborn Atheist, this is one of the reasons I don't use the expression in any form. The easy way out is simply to rearrange the words to say something cheesy like "Good Thing It's Friday", which is at least unambiguous that the G doesn't stand for "God". But the people who do this are the same people who refer to Christmas as "Holiday"--it's a copout. Really, in satire, you've got to really make a go for it--don't just use a cheap euphemism. If you're going to bastardize a well-known acronym, don't just try to say the same old thing while politely avoiding the parts you don't like; say something that doesn't make a damn bit of sense--but sounds like it should. It's the logical equivalent of smoke bomb: use it to make your escape from an uncomfortable argument while your opponent's brain is occupied trying to figure it out. There's a certain type of person that is unable to move on until they've figured out this type of puzzle. If your adversary isn't this type of person, they'll act like they understood what you just said, or at least ignore it. In that case, it's usually safe to assume they won't notice you just walking away either. For other logical brain-hacks, pore through the archives of NotAlwaysRight.com (H/T Loth). Especially the ones where the last line is "What???" That's the response you're looking for.